Lightsaber Theory Proves Rey's Parents Were in The Force Awakens? Wait, Rey's parents were in The Force Awakens? That's what a new Star Wars theory proposes, and it's not a half bad idea. Has this mystery finally been solved? Perhaps we won't know until The Last Jedi. But as far as fan theories go? This is a pretty good one. Perhaps the best we've heard yet. And it's helped along by some new evidence in the Star Wars 8 trailer. So, who were Rey's parents, and where were they in The Force Awakens? How about this? They were two of the many dead bodies surrounding Kylo Ren and his Knights in the infamous Forceback (or flashback) scene. We'll do you one better. Perhaps Rey's dad is the shadowy figure seen killed by Kylo Ren. In the flashback, it looks as though this mystery man in the big hat is about to bring his weapon down on Rey when Kylo pierces him through the chest with his archaic crossbar lightsaber. If true, that means this scene was just being shown from a different perspective, or that Rey's father was trying to kill Rey out of mercy. But wait, we're getting ahead of ourselves. And before we dig into this, let's remember that J.J. Abrams did say Rey's parents are seen in The Force Awakens before later retracting those statements. Perhaps he truly gave away the mystery, and we didn't even realize it? The Lightsaber Theory comes from Youtube user Jon in Theory. And it revolves around the mystery behind, not only Rey's parents, but also Luke Skywalker's old blue lightsaber that originally belonged to Anakin Skywalker, used in the Clone Wars. First off, to set this up, this theory purports that Luke actually had his lightsaber in his possession sometime after Return of the Jedi. Perhaps it called to him, and he went searching for it in an adventure we'll learn about in one of the upcoming Journey to Star Wars: The Last Jedi books. He later had Han Solo deliver it to Maz Kanata for safekeeping. Which would give reason for a Han Solo flashback...Again, getting ahead of ourselves. As Jon's theory goes on, it suggest that Rey's parents were never supposed to be Luke Skywalker, Han Solo and Princess Leia, or any other character we currently know in the Star Wars universe. That would all be a little too obvious. But any big twist in regards to who her parents are needs to make sense. It's speculated that Rey's complete backstory is tied to Luke's old blue lightsaber. And this is given away in the flashback scene from The Force Awakens. As Jon likes to point out, his theory is a tad bit complicated. But he does a decent job of trying to break it down. This theory suggests that it's quite strange how much Luke Skywalker lore surrounds the planet of Jakku, from The Church of the Force, to Lord San Tekka, and even the Millennium Falcon. It also can't be such a coincidence that Tikka's village is so close to Rey, where BB-8 is able to run into her and set off on a grand adventure. But the mystery behind Rey's parents is found buried in plain sight in the flashback. It's suggested that this scene lays out the entire bigger mystery that will be revealed in The Last Jedi. Jon spells it all out in the video provided below. He states this in as clear of terms as possible. "I strongly believe that one or both of Rey's parents were Luke's Jedi apprentices and that they're among the bodies we see in front of the Knights of Ren. An alternate way to interpret this is that Luke ends up giving the lightsaber to Rey's father or mother, believing them to be the rightful heir to the Jedi and angering Ben Solo because Luke doesn't trust him to carry on the legacy. This would be huge for a villain who's been set up to revere his grandfather. Luke might even suspect Ben is slowly being seduced to the Dark Side by Snoke as he picks his successor." This makes sense. And it ties into the lore as it's currently being set up. We can then add some new moments from The Last Jedi trailer. In the Force Awakens flashback, we see Rey walking the hallways of Cloud City on Bespin before Luke Skywalker's first lightsaber battle with Darth Vader. But then things start to crumble around her. And she falls to the ground, where she sees Kylo Ren and his Knights slaughtering a bunch of unknowns. We also see Luke Skywalker place his hand on R2-D2, looking at something burning in the distance. In the new trailer, we see that same shot of Luke and R2-D2 staring at the burning structure. Perhaps Rey's parents have just been slaughters, and Rey is inside the burning building. We see the structure fall on her in The Force Awakens. Maybe Luke digs through the rubble and finds her still alive. Or maybe someone else finds her alive, and takes her to Jakku. Maybe that's why Luke doesn't know who she is or that she lived in The Last Jedi when they meet on Ahch-To. Maybe, maybe, maybe. This is all speculative at this point. But some of these scenes and moments are starting to strangely add up. Going off of this, Jon continues. "After surviving this encounter, Luke leaves Rey on Jakku to protect her from the First Order and Kylo Ren, who might suspect another Force sensitive is around. Han, Leia, and Maz would know about Rey because of her parents, but they're not as familiar with her as Luke is. This would explain why Kylo seems to find Rey so familiar, yet he clearly doesn't know who she is when he talks to Supreme Leader Snoke." If any of this is even remotely true, it would explain why Kylo Ren is so upset with Luke Skywalker and the Jedi order. And it would certainly explain why he thinks that blue lightsaber should be his, since he is Skywalker blood. Ben recognizes the lightsaber the moment he sees it, so there is some history there that we don't know yet. Can you imagine if your Uncle gave a friend of the family an important heirloom instead of to a blood relative? There are going to be some grievances. And it helps set up the inner turmoil going on within Kylo Ren. He feels as though he was betrayed by family. "Kylo believes himself to be the rightful heir to Darth Vader by blood, but Rey is his natural enemy because she is heir to Luke Skywalker by the sacrifice of her parents, Luke's true successor(s)." Ah, fan theories. What would we do without them? Jon goes onto say that he believes in his Lightsaber Theory, perhaps not 100%, but it does fall within certain screenwriting guide rules. And offers a payoff for both longtime and new fans. It also utilizes certain popularized lore, and provides an opportunity for more adventures centered around this lightsaber. We're at a peak point in Star Wars history where it certainly loves to cannibalize itself. 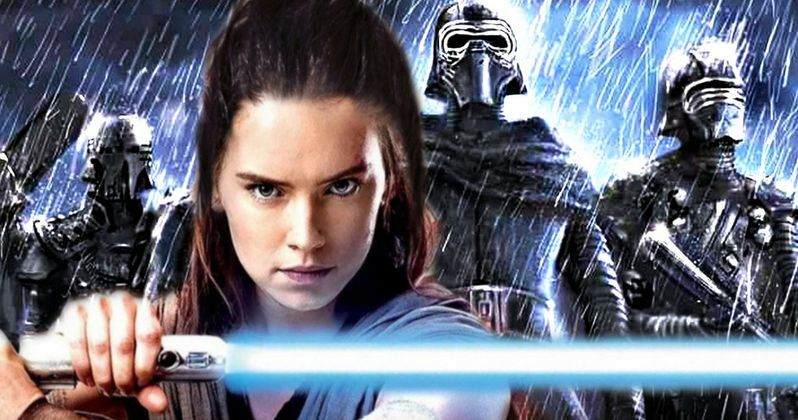 So if any of this is true, we can expect books, TV shows, or spin-off comics that give us the full backstory on Rey's parents and Luke's journey to find his father's old lightsaber. None of this lore will be thrown away in passing. To truly satisfy fans, The Last Jedi has to be a little sneakier with it's twist. And Rian Johnson knows how to perfect the kind of twist audiences don't see coming. As such, there will probably be aspects of this particular theory that aren't sussed out yet if it even remotely has any semblance of truth to it. Jon hopes the big twist regarding Rey's parents is a lot better than what he proposes. But truth be told, while we'll get a better sense of who Rey's parents truly are that answer may not arrive until Star Wars 9. Here is the theory video, with all aspects laid out for you to analyze, theories some more, and decide if there is any merit to it. How disturbing would it be to learn that Rey's parents were first introduced as dead bodies in The Force Awakens? Could Avengers: Endgame End Up Being the Next Last Jedi?